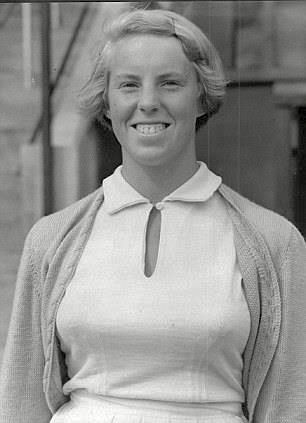 Ann Haydon-Jones was awarded the CBE having won the Womens Singles Championship at Wimbledon in 1969 and also the Mixed Doubles in the same year partnering Fred Stolle. Ann was born in Kings Heath in 1938 and during the early years of the war she, the only child, lived in the country with her parents. Later they moved to a small semi-detached house in Yarningale Road, Kings Heath. Her father, Adrian Haydon, ran a small printing business but was a keen table tennis player and was the captain of the English team for years. Her mother also represented England at table tennis. They started a table tennis club which met at a local scout hut, taking along their small daughter. It was not long before they introduced her to the game by piling up flattened table tennis tables so that she could reach the table. In 1949 she was preparing to take her 11 plus when she fell seriously ill with a viral infection of the kidneys. In Selly Oak hospital, it took her over 3 months to recover. The doctor tried out the new drug penicillin otherwise she would have died. However she gained a place at Kings Norton Grammar School where she did well at languages. At 13 she played table tennis for Birmingham versus other Midlands teams. The team now played at a church hall in Moseley. She started playing lawn tennis at Kings Heath Tennis Club and won Junior Championships at the Priory Edgbaston and at the Tally Ho. In table tennis she was the runner up in 3 world championship matches, but then concentrated on lawn tennis. parents did not attend the registry office wedding but they gradually came round. The couple had two sons and a daughter. 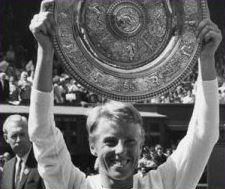 At both the Wimbledon Championships and the US championships in 1967 Haydon- Jones lost in the final to Billie Jean King. 2 years later in 1969 the two met again at the Wimbledon final. This time she took the most coveted title in sport, the first left handed female ever to do so. In 1970 she was hired by the BBC as a guest commentator and worked for them for over 3 decades. She was chairperson of the Womens International Tennis Council and British team captain for events such as the Federation and Wightman cups. In 1985 she was voted into the International Tennis Hall of Fame. She became the first ever civilian woman i.e. not a member of the British Royal Family, to present the trophies at Wimbledon, when she awarded the winners of the Mixed Doubles Championship their cup in 2007, a ceremony she now regularly performs. She has since presented the Junior Girls Trophy. She is still a member of the All England Tennis Club at Queens and the Edgbaston Priory.